Leapwise Media. Sketching in Design. When starting any project, whether it’s a small branding job or a complete UX/UI overhaul for an established client, we at Leapwise believe that sketching is one of the most vital parts of the process. Sketching can save you countless hours sitting at a computer completely overwhelmed with the project at hand or from going too far down the wrong creative path. Sketching can also expand your creativity and skill set; it doesn’t have to be strictly for client work. I often find myself sketching a lot, and I mean a lot. It doesn’t have to be anything client based, or anything at all for that matter. Just good old fashion pencil, paper, and imagination can lead to inspiration, as well as capture inspiration in the most unexpected ways. It’s really easy to get wrapped up in a new project. My mind goes all over the place and I immediately want to jump on the computer and get started. And that’s where I need to pull myself back and and realize that I am wrong. The creative process is called a process for a reason. It takes thought and time behind every action. Sketching is a vital part to this process. It helps us gather the good, the bad, and ugly ideas all in one place. And as I said before, it saves time. The amount of sketches one can pound out in an hour is vastly greater than on a computer. More sketches mean more ideas which leads to a more complete solution. Here at Leapwise we make sure not to get fixated on one direction either. It’s easy to sketch a few directions of a logo or page layout and fall in love with a specific element. Don’t let that hinder the rest of your sketches. If you like it, note it and move on. Take this example of sketches for rebranding tech company, Atlassian. 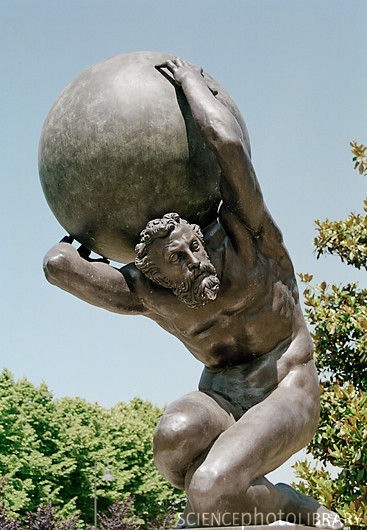 There was a clear concept of mimicking the famous imagery of the Greek god Atlas with the world literally on his shoulders. One thing to note here is how many different directions of this one concept there are. Some are more stylized and some are more literal. Some are good, some are bad, some are ugly. More importantly, you can really see how all of these ideas inspired the chosen direction. Like I said before, I sketch a lot. When I let my creativity and imagination take control, I can sketch anything from funny little characters to type treatments. Some are good, some are bad. More importantly I am experimenting with different shapes, forms, and materials. We believe it’s important to continually exercise your creativity. The more you sketch, even if it is aimless, the larger your mental library will grow. This helps exponentially for both layout design, and branding (just to name two). Don’t think that you’re good at it? Guess what, it doesn’t matter! Much like anything else, the more you do it the more refined you will become and the more techniques you will learn. Sketching can also be a way to express inspiration. Artists all throughout history have been doing this exact thing. Take a look at some of these famous artist’s sketchbooks. Get inspired, stay creative, and sketch.